To understand Chiron, the main character in director Barry Jenkins’s Moonlight, it might be helpful to understand what this young man — shown at three different stages of his life and played by three different actors — doesn’t have. No father guides Chiron; his crack-addicted, single mom offers no real parental support; no group of friends provides companionship; and no protector helps keep the neighborhood bullies at bay. Such observations make Chiron sound like a sociological statistic, a black kid suffering the deprivations of an impoverished life in Miami’s ironically named Liberty City. Although Chiron’s deprivations constitute a valid and appropriate description, they don’t go far enough. The most important thing that Chiron lacks is a voice. What makes Jenkins’s movie impressive are the ways in which he has coaxed the actors who play Chiron to be expressive without articulating the myriad contradictory feelings that whirl inside the character’s head. Chiron seldom speaks. You can (and probably should) spend time unpacking the various complex meanings in Jenkins’s movie: the drug dealer who becomes a genuine father figure in Chiron’s life but who, because he sells drugs to Chiron’s mother, is pained by his own hypocrisy; Chiron’s discovery of his gayness; or the multiplicity of causes leading to the violent explosion that criminalizes Chiron and redirects his life. All of those things are worth discussing, but Chiron’s voicelessness underlies everything worth thinking about in Moonlight. And by voice, I don’t mean only the act of speaking. I mean Chiron’s ability to define an identity that’s unshackled from environment and circumstance. In the movie’s first section, we meet the youngest version of Chiron, as played by Alex Hibbert. A slight kid who has been issued the nickname "Little," Chiron clearly is an outsider. In this section, Chiron encounters Juan (a terrific Mahershala Ali), a drug dealer who takes the boy under wing. Born in Cuba, Juan sincerely cares about Chiron. Scenes in which he teaches Chiron to swim give Jenkins an opportunity to display a tender, lovely touch. Not surprisingly, Juan’s concerns land him in a territorial fight with Chiron’s mother, a walking fury of woman portrayed by Naomie Harris. When Chiron reaches his teen years, Ashton Sanders takes over the role. Of the three actors who portray Chiron, Sanders has the least physical resemblance to the others, but his acting leaves no doubt about the adolescent Chiron’s connection to his boyhood self: his watchfulness, his ability to ask penetrating questions, his loneliness. In this period, Chiron has his first sexual experience, and again tries to escape bullies. He hides from his tormentors until an irrepressible anger breaks through his muted surface. Trevante Rhodes takes over the role when Chiron becomes an adult. By this time, Chiron has survived a stint in juvenile prison; he has bulked up, perhaps to armor himself against the world and against his own feelings. He’s also living a life that mirrors the life lived by Juan. I don’t know if it’s acting or physical resemblance or a combination of the two, but as this segment evolves, Rhodes reveals more and more traces of the Chiron we knew as a child. Eventually, Chiron reconnects with a friend from childhood (Andre Holland), a reunion that leads to the movie’s conclusion — which feels like a well-earned respite from all the previous tensions, if not a triumphant moment of self-realization. 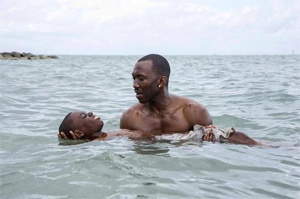 Whether you see Moonlight as a perfect movie or not, it’s difficult to imagine that you won’t be moved by the way Jenkins interprets and reimagines Tarell Alvin McCraney’s play, In Moonlight Black Boys Look Blue. It’s not easy to make a movie in which the main character is less actor than one who’s acted upon, less talker than one who is talked at, but Jenkins creates a richly realized world and moves us through it with insight and small moments of grace.